As part of my most recent NY trip I made sure to warn my friends ahead of time that much shopping would be done, possibly very little would be purchased, and that this was completely normal/what I expected. I also apologized in advance for any boredom they experienced. There was possibly no better example of this than at the Glossier showroom, where in the middle of the late afternoon, in full blazing summer sun, there was a freaking LINE. A line. To get in to the building and up the elevator. I sh*t you not, waiting in line with a bunch of chatty women at least two decades younger than me (some with THEIR MOMS) has never been less appealing than when I had to do it in over 100 degree weather. And then, when I did make it inside (and full disclosure, the line moved faster than I thought it would) the showroom wasn't even much cooler D:. I understand that everyone's AC was doing the most trying to combat the intense afternoon sun, but I cannot browse - let alone try on - makeup and skincare while actively sweating. It's just impossible. I compensated by doing the fastest round robin in history, viciously denying my dollars and time to products I didn't think would perform well (i.e. 99% of the skincare and all the lip products. My friend Jessy bought the raspberry scented lipgloss and the only thing she said to me afterward was "make sure to tell everybody that lipgloss is sh*".). Now, the way you actually shop the showroom is also unique, because instead of pulling products and collecting them as you go, when you walk in they hand you a paper with a checklist, and after walking around the (much too) small space, trying/swatching/smelling/etc, you grab an associate in a pink jumpsuit, who then takes your order. Finally, after all that, you wait and they call your name to hand you your pick padded envelope (that's in another plastic bag. So much plastic is wasted here.). 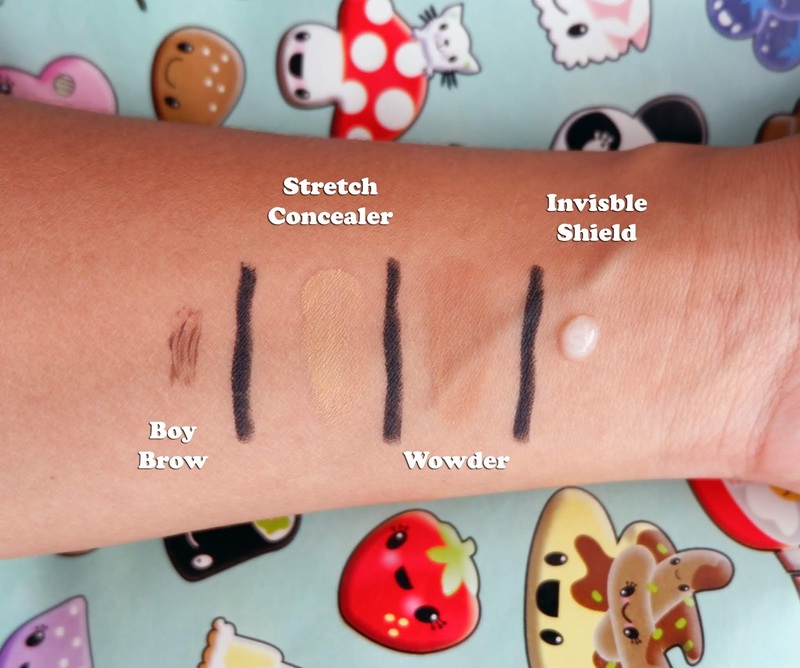 First up for review is Boy Brow and the Stretch Concealer, both of which I actually feel pretty positive about. 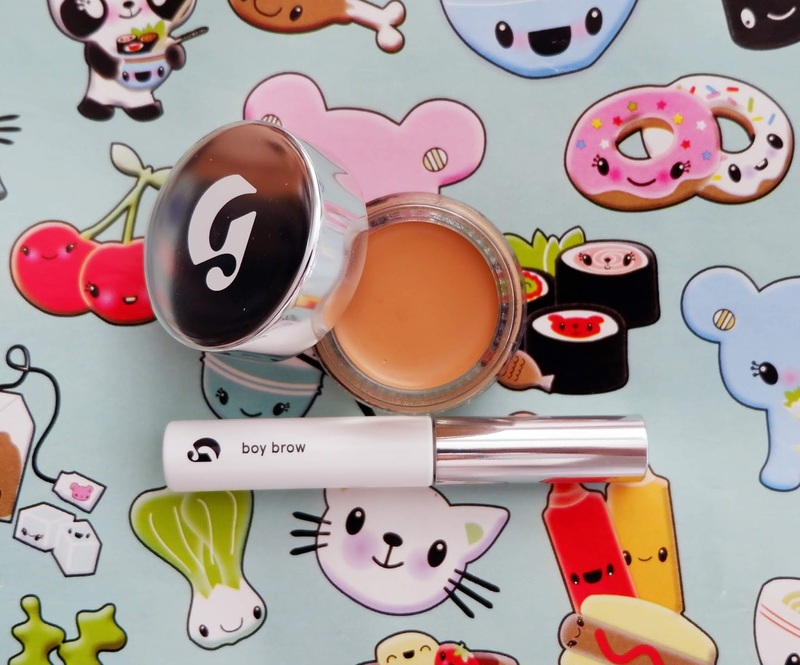 Boy Brow is a brow gel in a teeny tiny tube with a teeny tiny brush, and I went with the tinted version because while I have a little sparsity in the front of my brows, I'm generally too lazy to apply product to correct it. Now I didn't realize until after I'd completed my purchase that there is actually a darker color available, but I don't think it's noticeably too light. Instead I would say it does a good job of grooming all my hairs and keeping them in place for the day, while adding a bit of color just where I want it. I would say the same for the Stretch Concealer. I don't have super dark undereye circles, and the retinol's doing its job very nicely everywhere else, so a product like this that just brightens a tad without actually looking like "concealer" appeals to me. 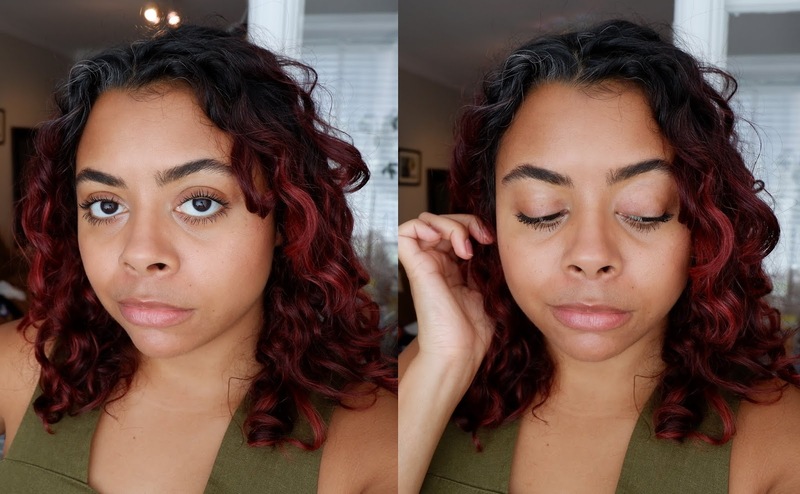 I would compare the way it performs to my YSL Touche Eclat, and while I don't get all day coverage, I don't think it fades in a super obvious way either. 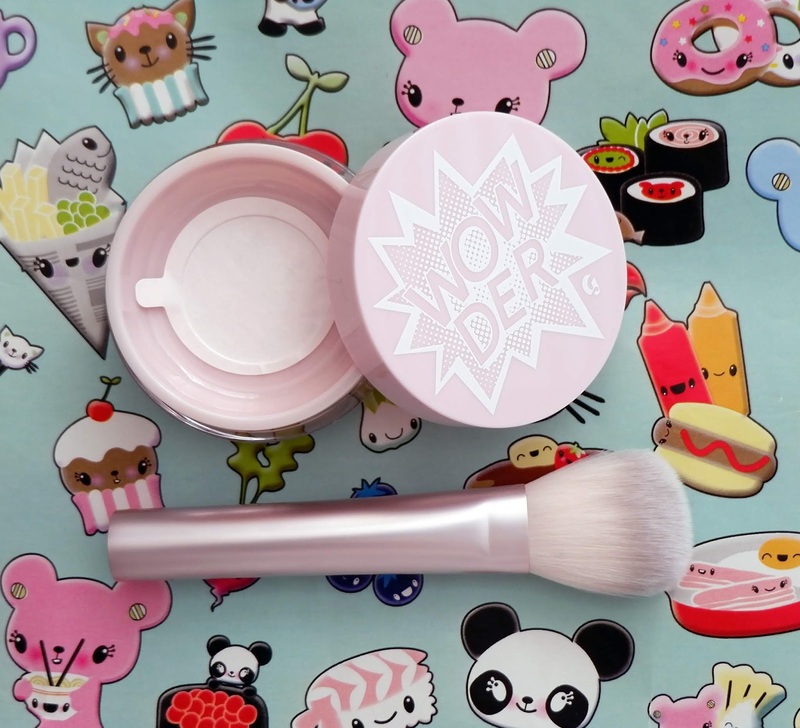 The Wowder is nice, as in the powder itself has a nice texture, but I can't decide if it actually has too much coverage for my liking. I heard a Glossier associate tell another customer that the coverage was comparable to the Skin Tint, just in powder form, which I agree with. My problem is that because the colors go from WHITE to dark/deep, when I apply this through the center of my face it imparts a bit more of a "tan" than I like. But since I also use very little at any given time, this effect could all be in my head. The brush is fine, it's there, but I would not have bought it if I'd thought more about its usefulness. 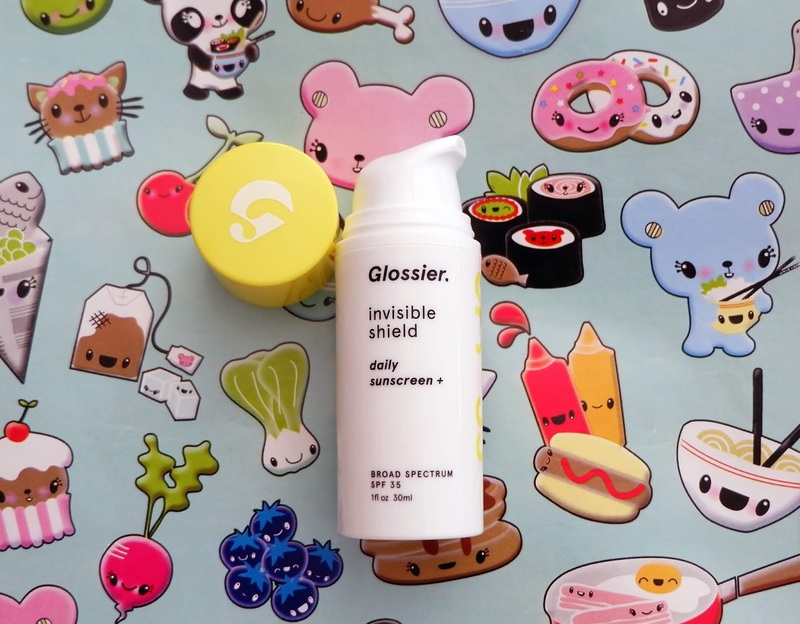 Now on to my only skincare item - Invisible Shield. I wanted to get my hands on this because finding a good sunscreen that doesn't 1) make me shiny AF 2) feel like silicone-induced death (*cough* Supergoop *cough*) has been a trial for me. I know I should just stick to Asian sunscreens and call it a day, but a girl likes to dabble and this one is worth trying. The price point is a little high for 1oz of product, but I found this one to be incredibly moisturizing, while also rubbing in to be completely undetectable upon application. All without any sunscreen scent. This may end up being too moisturizing for my skin during the summer, but as I'm still testing out combinations I'll have to get back to you with the final word on that. Now would I leave you without swatches? No, I would not, AND I love you all enough to post high def pictures of my face wearing all this stuff, even though all I can see is my mustache shadow. There is no before, but I think you can pick up on the places where the concealer doesn't completely cover, like the redness around my nose. I think you as the consumer are the only person who can really decide whether or not this brand is even worth trying, but all in all I'll admit it was better than I was expecting. So huzzah for not totally wasted money! I visited in early June and the AC was out then, terrible! But I did enjoy the boybrow in the darkest shade. The other products were hard for me to consider because I was too hot.